Stretch Inc. has started shipping the first product incorporating the HDcctv specification that will let cameras transmit high-definition images over coaxial and twisted pair cable. 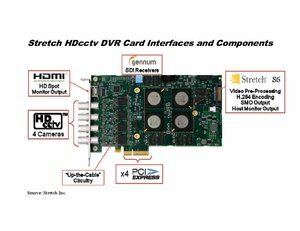 Stretch, an OEM manufacturer of DVR cards, was one of four companies that last month announced a joint commitment to develop and ultimate standardize a new spec, dubbed HDcctv, that would allow unencoded HD images to be transmitted across non-IP infrastructure. Stretch has begun initial deliveries of its VRC6404HD card (pictured, click to enlarge), which uses the Peripheral Component Interconnect Express (PCIe) expansion slot now common on PCs and servers, said Bob Beachler, vice president of marketing, operations and systems design for Stretch. The card is capable of high definition capture of up to four channels of either 720p or 1080p HD at full frame rate. The card uses coaxial cable interfaces to receive high definition video from analog cameras, with an HDMI output to monitors. It is compliant with the initial specification developed by the recently formed HDcctv Alliance. "We were highly motivated to get something out as quickly as possible," said Beachler. The card uses an HD-SDI chip from Gennum Corp., another alliance founder. EverFocus and Ovii are the other two founding companies. Comart System and China Security and Surveillance Technology (CSST) have since joined as charter members. Beachler declined to specify OEM customers, but did say the DVRs incorporating the new Stretch card should start shipping by the second quarter 2010 and HDcctv DVRs will be demonstrated at the ASIS annual conference in Anaheim in September. The card also incorporates H.264 using Stretch's scalable video codec (SVC). This allows users to dynamically set resolution and frame rates, allowing for more efficient bandwidth and storage. "You can pick and choose what you send across the network and what you store," Beachler said.